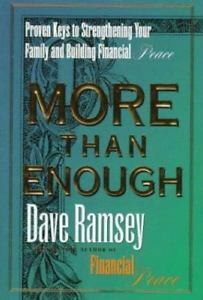 Copyright 1999, I’m behind the times with this version of “More Than Enough” from Dave Ramsey. What I liked about the book is that you could see the ideas of his later books forming in this one. I’m not sure I would classify this book as a financial book, it’s more of a behavior text on how to succeed in your aspirations. The entire book is filled with what we now call today (in 2019) Dave Rants. It provides counseling, quotes and stories touching on good moral values, integrity and character. Another aspect this book brings is a lot of repetition, however, the repetition tells a story as you read through the chapters. Dave starts with values, vision and goals. He then maps a path that detours into hope, work, diligence, unity, contentment and giving. In between those detours are plenty of stories, quotes and motivational statements to get you fired up. Dave’s formula for financial piece starts with a decision to change. You work on getting better with managing money and get out of debt. From there, Dave focuses on character and building long term gains with positive moral influences. Surround yourself with who you want to become and be a better spouse, parent, friend, co-worker or citizen. Finally you finish life by serving and giving to others. The financial piece is just a part of the journey to a fulfilling life. I recommend this book but I should set expectations. This is not just a ‘how to get out of debt’ book. It’s a motivational text on becoming a better person to serve others with a side benefit of financial freedom. It’s Dave’s way of telling you that you can do better and live a more fulfilling life. Check out my last book review here. Why would you share this?